Is a WIP resulting from over a decade of experimentation with various mediums to create electronic visual media both solo and in collaboration. 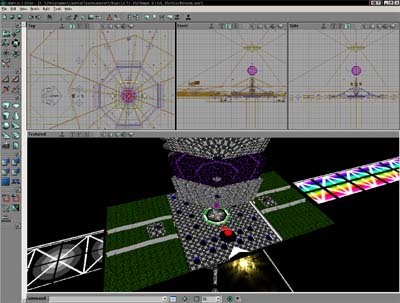 The map embodies elements and techniques of VJ'ing developed over the years along with a host of open ended possibilities the engine has brought along with it. 1. BSP holes allowing for video feedback like effects. 4. Use of weapons as light-sculpture generators. 5. Control of lens angle & focal length. 6. Control of time - clock speed. 7. Ability to pause time. 8. Use of animated bitmap textures. 9. And of procedural textures. 10. Multiple player camera angles t o cut to. 11. Variable speeds for player/camera movement. sessions and returns ini files back to orig state. Development of this version may stop here with UT2004 being released, along with its UnrealTV capabilities and a host of advanced features which also encompass and also expand on the existing UT ones. I may port this map into UnrealEd v2 and retro-fit it for UT2004; Aiming for a release during the DAS/ACMI collaboration. Stay tuned! On 15th July a paper by Adem Jaffers was presented at the Free Play 2005 independent game developers conference hosted by Next Wave Festival and held at ACMI. 'A Binary Input to Flesh Antenna'; see Discogs ref.